Posted in: Uncategorized. Tagged: derivatives, futures, Options, VIX, Volatility, VXX. Being short volatility has been an easy trade this year, and it may be that folks are not aware of the potential risks of holding short vol positions when the VIX is trading at levels not seen in 7 years. So, since this week was incredibly quiet on the volatility and market front, let’s take a quick look at what can occur if you are short volatility at very low levels. This chart should really bring it home. Market tops frequently occur in April and can often hold that top well into the fall. The market has been hammered the last three springs, and this is not a recent trend. The best six months for investors historically are November to April, and if that is all you did in your life, you would be a big winner. Since 1950, investing in this fashion returned 6700%, while investing from May to October returned -10%. May is one of the worst months of the year for the stock market, ranking #9 in the Dow and #8 in the S&P. As I highlighted the other day, when there is no down month in the year before May, the month of May has an even poorer record. Thus, we are buying incredibly low implied volatility in May and June. This is not the 1990’s, not even close. 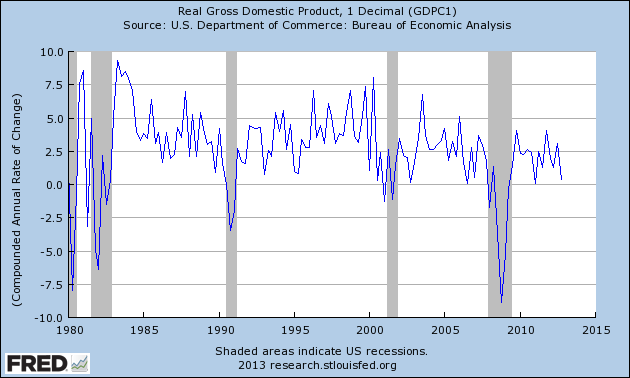 The last time we had an up May without a down month during the year, the GDP for the second quarter was 7.1%. To explain what Pokies may be going on we reached out to one of the best volatility analysts in the business, Christopher Cole at Artemis Capital Management. He offered us some thoughts by email. The behavior of the front of the VIX futures curve indicates that traders and investors have bought into the hope we have entered into a new low-volatility regime and that central banks will succeed in limiting all tail risks. 2012 was one of the best years for volatility short sellers since 2006. The back of the curve continues to be dominated by longer-term fears and institutions unwillingness to supply vega to the market but the short continues to get pounded down any time the VIX ticks up. For me – I remain very skeptical. There are a lot of “vol tourists” today. In a yield hungry world you have a lot of people turning to the easy trade of shorting front month volatility in a believe that the Fed will always have their back. A lot of these players don’t truly understand the asset class but nonetheless are overconfident based on the recent performance and simplicity of directional short bets in vol using simplistic VIX ETNs. A powerful convexity is being built into short term volatility futures due to excessive programmatic shorting, levered ETNs, and these ‘vol tourists’.This convexity and vol-of-vol was on full display yesterday. If 2013 begins to look anything like 2007,2010, or 2011 given the recent expectations of the VIX futures markets these ‘vol tourists’ are in for a nasty surprise. As for this being unique… hardly… people have a very short memory (or they don’t do their homework). Below is a chart showing the shape of the VIX futures curve following the largest log VIX spikes since 2004 when the VIX was <20. 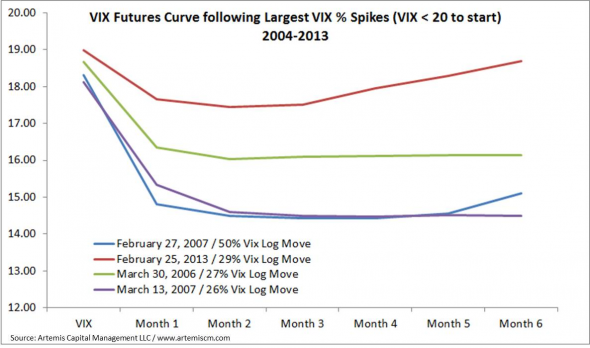 Yes… this VIX futures curve shape is unique for 2010-2012… but it resembles the performance of the futures following VIX jumps in the pre-crisis era. In other words, shorting Vix has been a hugely successful trade post-crisis because of a general belief that real volatility will always be absorbed by the state, so there is no real risk associated with collecting premiums from selling short-term volatility. My take on this is simple. I like probabilities. The greater probability is that the market will experience lower prices and higher volatility at some point over the next few months. Implied volatility on index puts are incredibly cheap. Buying volatility products in general is a loser. Get some vol where its very fairly priced and be wary of being short volatility. We may get a great April and May in the markets, but history makes a solid argument for the other view. Posted in: Uncategorized. Tagged: analytics, futures, Options, VIX, Volatility, VXX. I don’t know what everyone else is thinking, but I want exposure to May’s low implied volatility. But I don’t want to pay exorbitant premiums. Heck, I already own VXX calls, and I hate owning those, but they were cheaper than VIX options when I bought them, today they are at pretty much parity. The VIX option at 14 is $1.20 and with the VIX 14 future trading at 14.15, the VXX ATM call is 1.28. The VIX options are now cheaper, but the VXX gives you 3 days longer until expiration. The IWM was lagging the other indices today. I will have the opportunity to carve out some more of the cost of May after next week should I so choose, but should markets begin to descend, that would work also. The April jobs report miss triggered a market downturn in early April of 2012, and that is on tap for next Friday. I will be adding more May volatility next week if the markets continue higher. The “money on the sidelines” talk is omnipresent again, yet no one quantifies that and seems to use this fairy tale to convince themselves that there’s a greater sucker to buy after a prolonged and unpaused rally. Break out the history books, even the best years have significant market drops. May is generally only kind to investors when there have been down months preceding it. This is the key that no one seems to understand. In 2010, the market rose 10.5% from Feb to Apr until May put an abrupt stop to that with at -8.2% month. Aprils frequently represent tops in the market for several months. This was true for 2012, 2011, 2010, and many other years. There has not been a positive May without a down month in the S&P preceding it that same year since…..1996. And the market was only up 5% heading into that May. It also occurred in 1995, but the S&P was up 34% that year following a down year in the S&P. This market is going down for a pause soon, it is just a matter of time. And May is what usually does the trick. This is one of the few street adages that is actually supported by a lot of historical and cyclical economic data. A .You are able to sell any IWM equal or lower strike put against your long position for the entire time you hold the long May put without using margin. Thus, every week for 7 weeks you can chip away at the cost of the long leg until it is essentially free. Because IWM weeklies are offered for at least 5 consecutive weeks out, you have a ton of flexibility and opportunity. B. The market risk here is to the downside as opposed to the upside. C. You get an implied volatility in your long leg of 13.2%, yet you know that this has a higher beta than the S&P 500 that is pricing May volatility at around 13.5%.This is a bargain. D. If the market goes higher, you can set another calendar at a higher level and create a double calendar that improves your probability of a winning trade. See Dan Sheridan for more on this topic. Posted in: Uncategorized. Tagged: futures, Options, VIX, Volatility, VXX. Stocks and volatility looked confused today, while the VIX futures barely moved. Stocks opened higher on what seemed like a resolution that may have opened up a larger can of worms in Cyprus, then sold off in what seemed like blazing speed compared to the movement we’ve seen in the indices over the past 3 months. How would you like to have your money in a bank, see it lose 30-40% overnight, then know that you can’t take it out anytime soon? What would you do if you could remove it? How are they going to open the banks? If you are pondering these things, real depositors over there are doing the same thing. So, stocks rejected higher price and then rejected lower price in the same day. The VIX opened 10% lower, and subsequently surged to over 14.50 in a little over an hour. It’s important to look at the VIX term structure occasionally, and I intend to highlight this more often in this space. The top chart instant online payday loans shows the actual S&P option VIX values that comprise the VIX on a rolling basis, while the bottom graph are the futures term structure. On April 12th, one week before OPEX, the VIX will be all May, as it rolls one week early. It also will assign a negative value for June during OPEX week to balance that out. So we are two weeks into rolling into May, and that weighting gets heavier every day. The May futures are pricing in 10% higher volatility for that cycle. Last year, May VIX crossed 25. And VIX was hovering around 14 on March 23rd, so you can see what can happen in a hurry during historically weak months for stocks. Of course, just because May has been rocky, many of you will say it won’t happen this time around. Maybe so, but seasonality of the markets should be respected. Closed April $18 VXX puts early this morning for a 47% gain, selling at .28 with a basis of .19. We now look to May puts if we decide to short volatility with the VXX on VIX spikes. Still long VIX 14, VXX 20 and 21 all for April. A churning week as profit takers and late bulls are on opposite sides. Deep selling is probably not in the cards yet, although with our positioning, that would be welcome. After the first couple days of April, things could get interesting. April was unkind last year. 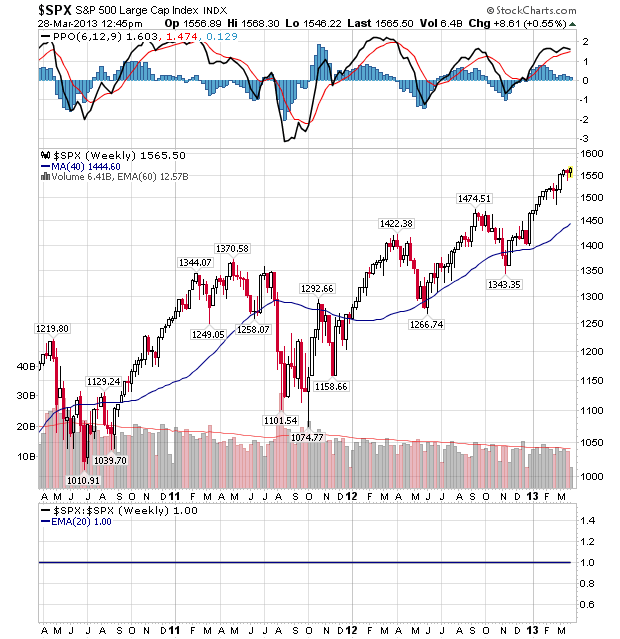 The market is struggling with 52 week highs while sentiment and the news is turning bearish. Sound like springtime? Everyone wants to read FDX and ORCL earnings into a global and earnings gloom context, and frankly I can’t tell you if there is a read-through there. The simple fact is that the bull has had a long run and April turns into May, and you know the rest. The European market headwinds aren’t any worse; they’re just being listened to and reverberated. That comes with market prices going lower, as news follows price. People always want an explanation for market moves, and stating the fact that there were more sellers than buyers is not enough to sell media. This is an age old phenomena, well described in Reminiscences of a Stock Operator. There are only 5 days left in the quarter, and the folks whose career rides on sending out paper on specific dates on the calendar tend to get nervous. Next week sets up as bearish, so we are sitting on some long vol Buy Viagra positions. The VIX rose 10%, yet the futures aren’t buying it yet. Another 10% rise in the VIX and they’re not going to have any choice. Closed VXX $19 puts for .60 and a double. We should have closed them yesterday, but it appeared that Ben would at keep sellers at bay for a couple days, but we were wrong. Still a rock solid 100% return on those. Still holding the $18 puts, as we got them so cheap during the last spike. Closed the weekly short legs of our VXX calendars, so we are long VXX April $20 and $21 calls. We will start selling on any spike, because April is still historically a good month for stocks. Long VIX $14 calls. To be sold on any spike. Next week sets up as bearish. We could see the VIX reset its range, from 13 to 16 or so. With May around the corner, a sub 12 VIX would be a surprising figure as the VIX is rolling into May right now. Posted in: Uncategorized. Tagged: analytics, derivatives, futures, Options, VIX, Volatility, VXX. I am always amazed at how the financial media misunderstands the most basic of concepts. Today we again witnessed this in the form of the Fed mandate. It could not be simpler, low unemployment and 2% inflation. That is it. Ben must hate going to Congress and speaking to reporters who ask stupid question after stupid question. How many times does he have to say “several months of improving labor conditions”? 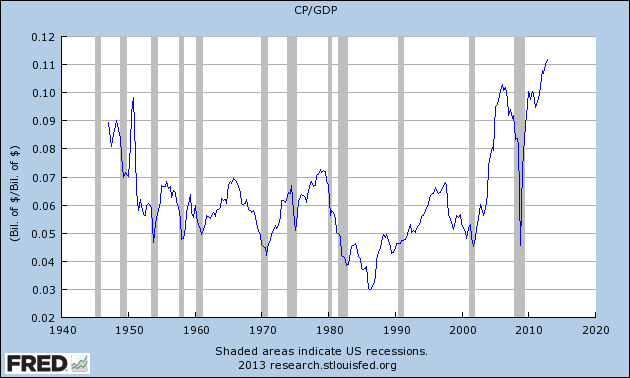 We get one or two months of decent payroll numbers, and everyone wants to panic about the end of stimulus. What is the unemployment rate right now? 7.7%. Nobody listens. He constantly describes pulling stimulus too early and the historical significance of that error. He constantly talks about the damage long-term unemployment is doing to the economy. He talks about how every little start in the U.S. economy has been followed by a slowdown, and that he wants to see extended strength. Plain English is often the hardest to understand for some folks, especially pundits. Twain said that ignorance and confidence ensures success. Apparently that is the definition of TV punditry. Onto the VIX which fell 12% or so today, just as we expected. Cyprus is almost done with its 5 minutes, because the issue is so minor and the media gets bored quickly. Once the small depositors are guaranteed to be off to hook for good, this story is probably over. I want to describe an error Cialis we made in trading VIX calendars that I hope will help those in the future not repeat the same mistake. About a week ago, we entered two long VIX calendars, at 13 and 14, selling March and buying April. We collected roughly .65 and .35 cents respectively for the March contracts and these fell to .10-.15 or so on Friday. With only two days to go to expiration and the VIX sitting on 11.30, we stood pat. Big mistake. Always close the short legs when they have worked. If we had done that on Friday and were holding the long legs only, the calendars would have generated an enormous profit in just a week, well over 100%. Instead, with the VIX spiking to 15.40 on Tuesday right in front of VIX expiration, we were left chasing the short leg and closing the long leg as a prudent risk management move. If we left the Aprils open, we obviously would have made a bad decision worse, as the VIX plummeted, and so did the VIX options. Incredibly frustrating and painful trade, having done almost everything right, just to have it taken away in a couple hours of trading with no recourse the next day. Lesson learned: when you are short the front legs of a calendar, especially one with volatility, close the short leg when the risk/reward has shifted against you. Still holding VXX $18 and $19 puts. The 18’s have gained almost 100%, the 19’s more than that, but we have them on the shortest of leashes. If I could have closed the 19’s for .75 today, I would have. The risk for VXX is now to the upside, as the front month is the entire holding of the fund and it is trading for 14.45. Negative roll is around 10 cents per day. If the futures fall below 14, we may get long VXX options. Outlook: Quiet trading for a bit, with lots of housing data points tomorrow, Tuesday and Wednesday. Market closed next Friday, so will nervous nellies sell into quarter end? Volatility is coming, but our guess is that it will be shortly after the first of the month. If the derivatives market sees the future better than the stock market (many claim this to be the case), those folks made it clear today that the rally in the equities market is not over. When the VIX crossed 15 and appeared to be headed much higher, the futures barely budged, and this was a clear indication that the volatility in the market was not going higher today, and that the sell-off in equities was not driven by significant fear. The futures barely touched 16 when the VIX hit 15.30. At the end of the day, the April contract ended up falling on a day when the VIX rose 7%. Tomorrow the April contract is the front month, and will roll into May. May will probably hold its value for throughout the cycle, as the month is notorious for vicious market sell-offs. Therefore, the negative roll could get expensive for the VXX. This roll could very easily be 10% for the next 20 trading days. Yet if you are short the VXX as a short-term trade, a sell-off in equities of the real kind will certainly drive futures far above today’s prices. The way the market handled the Cyprus nonsense spoke volumes. There were a few sellers and few buyers. At the end of the day, shorts were left wanting again, and covered into the close. Once Ben states that he’s pumping primer until 2033, who would be surprised if the market rallied to new highs? People forget, dual mandate: interest rates and employment levels. He is in no danger of an issue with either, so the pump is on. He is a huge advocate of not cutting off Â stimulus until he is sure the economy is moving strongly forward. He specifically studied the effects of pulling stimulus too early after the great depression and the stock market crash and recession of 1937. Closed the short legs of the VIX calendars, holding only the VIX $14 calls. Still long VXX calendars, Mar4/Apr, and will roll the short legs forward Thursday provided they haven’t eroded. Still long Apr. $19 VXX puts. Added VXX $18 April puts for .19 as tweeted this afternoon. Still anticipating some quiet trade and the Cyprus situation to fade into the background. Tomorrow will be primarily Ben and a “stay the course” theme. VIX Moves Higher on… Cyprus?? Posted in: Uncategorized. Tagged: analytics, futures, Options, trades, VIX, Volatility, VXX. Insolvent Cyprus banks were the talking-head points today, in what was a comical display of ignorance and ineptitude by TV pundits and political leaders. CNBC actually had the google map app out, because I bet 4.7% of Americans have heard of Cyprus and 1.3% know where it is. This news story doesn’t matter and will be forgotten. People are having difficulty with the concept that the American economy and financial system have moved on from Europe, are building houses and finding jobs again, and that the major problems for the Eurozone have passed. As soon as you do a shred of homework on the situation, you realize that a bunch of wealthy Russians are holding large deposits in a tax haven, and the battle is really about who is going to pay the price for the idiots there who over-invested in Greek bonds. Essentially, the country is battling the balance between hitting the banking business (rich Russians who would leave) or ordinary citizens that don’t hide money for sport. The deal will be probably be amended to lessen the blow on those with smaller deposits, the parliament will approve it, and the world will move on after Cyprus has its 5 minutes of fame, not even 15. So the VIX futures awoke from their slumber and natural hedging at low prices in SPX options raised the both to reasonable levels. A rise in the VIX of 18% to 13 from 11.3 is not really news worthy, but since most in the media don’t understand the VIX, they will make it seem like news. 13 was a five year low a few weeks back, now it represents a significant shift in fear. Nonsense. The real game is in futures expiration. Only one day of roll left in the VXX and the April contract will be front and center. Every tick in the front month will move the VXX. It’s actually a good time to hold VXX if you believe that the market is heading lower over the next few days. The April contract moved 4.7% higher, and the VXX-IV moved 5.08%, with the couple bps difference owed to the two days of March futures left in the fund that rose in lockstep with the VIX. This is no man’s land for the futures. They are too high to spot VIX, yet not high enough to sell. Still long the VIX and VXX calendars and the April VXX puts, so high, low or flat vol works. Our VIX model shows a modest rise in volatility early this cycle than lower vol later this week into next week. If the futures spike to 17 or so, we will look to add VXX puts. In the meantime, once our calendar March legs expire, we may sell April calls to shave off even more of our VIX option cost. It will all depend on what happens after Wednesday’s settlement. The weekly put position is going to need a market rally to work. If the VIX April future retraces to 14.4, the VXX will be 20 and we may get out unscathed. This is not a crazy scenario, but probably is about a 30% probability. We will post our proprietary VIX model chart later this week. Tomorrow housing starts and permits, and the Fed meeting to say nothing but more of the same may put Cyprus in the rear view mirror shortly. With the VIX at 11.30, a lot of put holders/buyers at 12 and 13 can make a lot of money fast. If the VIX settles right here, these puts will more than double. These settle in cash on Wednesday, when the opening hour of trade determines the settlement price for March. This can be gamed, by purchasing (or selling) OTM SPX options to drive up (or down) the VIX percentage at the open on Wednesday, but that is a topic for future consideration. We tweeted out two trades today, a long VXX calendar where we sold March $20 and bought April $20. This will work perfectly if vol remains low next week and these expireÂ worthlessÂ and then we will be long the April $20’s for only .85. Then if we get a spike in vol before April 19th, we may get an asymmetrical return, which is what we always want, risk X to return 4-5X. We also bought Mar4 VXX $19.50 puts for .16. This is a smaller position. Long Mar4/Apr calendar VXX spread for .85 debit. Short Mar4 $20 VXX call, long Apr $20 VXX call. Long Mar4 VXX $19.50 put for .16. Next week sets up historically as bullish with low volatility early in the opex cycle. As March drags on, there is the potential for skittish managers to book their quarter, so we may see more volatility soon. While we expected a quiet week in the equity markets and a corresponding VIX that trended lower, this has exceeded even our expectations of pure quiet. We’ve seen total high/low spreads of 6-8 S&P points from top to bottom for 4 days essentially. This kind of action represents a VIX of under 8 on an annualized basis. Amazing. The VIX is barely moving, and the VXX is holding up because the futures in April have a massive premium to spot, nearly 30%. I suspect that a considerable roll is occurring from March to April, and once everyone is in April, those front month futures will start to fall. This is all provided the VIX and the market remain quiet. Now, while I really hate to actually write the words forthcoming, it is becoming evident due to the price of the futures and the fund’s current holdings, that Â VXX options are almost a buy. Almost being the key word. If you eye the front month futures on Tuesday, and the April contracts fall 5% or so, then you are looking at a potential short-term opportunity to get long volatility. Here is why. On Wednesday with the VXX you may be essentially holding options on April futures at a price of about $14. If you wanted to go buy the options on the VIX for April at $14, you are going to pay 1.50, or 11%. If you buy the VXX calls you will pay less than 10% at the money and you will get 3 more days of time, as they expire on the Friday after VIX expiration. Lots of IFs in there though. IF that trade materializes next week, we will tweet and post it. Otherwise, we already have long volatility positions by having bought calendars, so we are ready for volatility to sit here, or move higher, or do nothing. We have long vol, short vol, and decaying premium all on right now. See prior posts or performance tab to see the current positions. No new positions. Long VIX calendars and VXX puts. Closed HRB calendar spread for -.19 loss. Quiet trade through Tuesday, then with the end of quarter in sight for PM’s, let’s see who locks in and calls it a quarter between now and March 31. Volatility will rise soon, maybe not next week, but soon. Posted in: Uncategorized. Tagged: analytics, derivatives, futures, Options, scott murray, VIX, Volatility, VXX. This is what happens at the end of the expiration cycle. While the VIX futures cling to a decent size premium considering the time to expiration, a VIX upside move has less of an impact on the futures. There is still a buffer between spot VIX and the futures that will absorb 6% VIX moves like today. This rolls off during the week to get to 1-1 by next Monday. This is so that the VIX escapes odd behavior due to opex week, yet it depresses the VIX a bit due the heavier value being the outer expiration. So, the VXX closed too high yesterday relative to its indicative value, the futures absorbed the VIX move higher with only days to expiration, and therefore you have a 1.5% move in the VXX. Nothing. Looking to add a VIX position for next month, be we will watch this week’s behavior in the market and in the VIX. Still holding VXX $19 puts and the VIX calendars opened yesterday to take advantage of the decaying March short legs. They VXX $19’s fell 7 cents today, but with the futures much higher than spot, we will watch how these two converge before we close it out. It is still very possible that these improve over the next week, but if the market breaks down significantly in the interim, then there may not be much more in them. This is historically a quiet week for markets and the VIX, and the snoozefest over the last two days has done nothing to alter that view. No real data points on the horizon with market moving power this week. Retail sales have been foreshadowed by store comps and earnings guidance. Friday sets up as very bullish historically.